The South Pole: Solo but not Alone: Day 30: Let free, and a great day's skiing! Elevation: 2 745 metres... Really not much more now! Well, around 3am this morning the change to the warmth and brightness of the sun woke me, and I knew I'd been set free... A quick peek outside confirmed the storm had passed and I'd be back on the road again! I was so excited, I almost got up straight away and got the day going. Pragmatism took over, as my routines would all be messed up, but I did decide to get up an hour earlier than normal, TO GO! The storm had definitely left its mark: the windward end of the tent was heavily buried in snow, and some tent pegs were quite a challenge to locate! It was pretty warm, and the wind had switched back to a light SE, so all good signs that things were returning to normal. The whole terrain was different today, lots of beautiful wind-formed patterns on the ice - gentle, artistic ones, from waves, to small mountain ranges, to minature dunes, none more than a couple of cm high. I stopped quite a few times to take photos of the most interesting patterns. 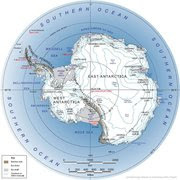 It is amazing how this Antarctica changes along the way. I'd love to know why there is dense huge sastrugi some places, and yet right next door nothing? It's not just the wind, I think it's ice flow related as well. Many times today as 'we' were skiing along, suddenly there would be a loud, moving ice-shattering noise coming from right under the sled. Scary at first, but then I got used to it. Seemed like it was a 'resettling' of the ice underneath as 'we' catalysed the process. Not much else to report. It was just a focused, production day! 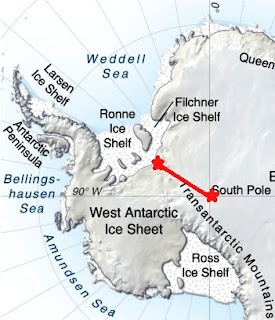 Only 154 kilometres to the Pole now! I'm hoping for 26th arrival. Pity about not being there for Christmas, but so be it! I'll have a Christmas similar to 2007, when I was in the middle of the North Atlantic, just me and my yacht... Very special in a strange way! I'm not a big traditionalist in this domain... Had too many when I was living with my parents! Hey I hope your run up to Christmas is going well... For those going away: Travel safely! No philosophy today: A rest day! Not sure for whom?? I'll touch on 'Belonging' and 'Identity' before the Pole, so maybe think about these terms as you go about your shopping and wait in the 'mindless' queue! Hoping for a good recovery tonight and another big kilometre day tomorrow! Tent bound is only a temporary situation for you, Howard! We are getting so excited here about the countdown to your goal and your blog keeps us talking every day about the things we have all been through and how different we are coming through the other side of these challenges. And you are doing it and telling us about it along the journey - brilliant! I poured away a last drop of whisky in a bottle on the same day to be up there with you! Good on yer mate! hi Howard, your spirits are soaring and it's infectious. I am really enjoying your two journeys. Have a good one tomorrow and I'll have a single malt for you this evening. RMC & I are enjoying your trip reports. This one is really tough one. We look forward to your success one more time. Sounds like an outstanding day, Howard! Although, I'm not a fan of the ice-shattering noise! I hope to someday see your pictures. Sometimes your descriptions make me laugh. The one that comes to mind is "sustrugi army". I don't have any whiskey, how about hot chocolate with miniature marshmellows? Fa, la, la, la la...la, la, la, la. Sandy T.
Well done on the routine.Great 35km!Good day after yesterday. Soon you will be down to double digits.